Vegan, raw food and health are amongst the big food trends and they were reflected in some of the key equipment launches on show at the 2019 CESA LET Forum. Allergens are another focus area and there were lots of food safety ideas and concepts, with purple now accepted across the industry as the allergens cross-contamination prevention colour. As usual there was a host of new ideas in tableware, and whilst the march of melamine shows no signs of slowing, there were also a lot of new porcelain and stoneware products on show. One supplier even had a potter working at the wheel, adding a theatrical flourish to their presentation. Sue Hunt of Drinkstuff was a first-time delegate. “It’s really good, very useful and definitely to be recommended,” she said. The Forum has become so popular it now stretches over two days, with an awards dinner on the first evening. Three awards are announced. The Distributor Cup recognises the company who has done most to support the promotion and sales of light equipment and tableware over the past year. For the third year running it went to Alliance Disposables. Meanwhile the Sales Professional of the Year is all about an individual who has contributed most to sales of utensils and smallwares. This year’s winner was Antony Chaplain from Brakes Catering Equipment. The CESA Donald Bird Award was given to John Gilbert, who was the driving force behind the growth of Gilberts. “John has always championed light equipment and has unbelievable passion and enthusiasm,” said Steve Goodliff, who presented the awards. Once looked down on, now actively sought by operators looking for something different. Five years ago they wouldn’t have considered it, now they are mixing melamine dishes and bowls with porcelain, while some are looking to use it for all their tableware, even for main courses. The main benefits are durability and price, although even the keenest supporters admit it can be a Marmite product and won’t suit everyone. The Forum saw so many different takes on the modular buffet display concept, from simple wood blocks with shelves over and trays under, to clever systems that can be configured to fit a wide range of applications, and adapted to new requirements. Colour is in, from brightly patterned bowls to mute greens and greys. Even cutlery is going coloured, with gold and black finishes or coloured plastic handles. Having said that, the Forum’s feeling on white tableware was mixed – some say it’s slowing down, to others it’s more popular than ever. Using bowls with a different shape and colour, plus some decoration or texture, is an increasingly popular way of adding style to the table. Driven by trends like fusion, Asian and sharing, bowls are getting bigger, in every sense of the word. Bowls with plates, diverse colours, even mixing different manufacturers’ products. Mix and match not only adds to the theatre of the tabletop, it also lets you freshen things up by mixing new crockery items with old ones. Hardly a rim in sight, but plenty of coupe plates, or flat bowls as they are sometimes called. As operators look for the elusive point of difference, there’s increased demand for personalised and bespoke products. From etched wood to decorated cookware, suppliers are responding with new ideas. In some cases, very low numbers of pieces can be personalised, so even independent sites can get in on the act. It’s getting bigger, and not before time. Lots of eco products, including compostable coffee capsules made using corn starch, reusable collapsible cups, stylish glassware made of recycled glass, porcelain made of recycled porcelain, and robust, drink-proof paper straws. Copper or bronze or gold? Similarly some commentators say copper’s day is over, yet it still remains popular. Bronze, on the other hand, is having its moment, as is gold. Although there were still plenty of new wood products on show, some suppliers reported a drop in demand, with wooden chopping boards being replaced by hard wearing plastics and recycled materials that have the advantage of being dishwash safe. However, others reported good sales for wood, but with a move away from the fashion of serving hot food, such as steak or burgers, on wood. Instead wood is being used for a wider variety of presentation and display applications. For food presentation small is still big. Mini baskets, cutlery, pots – even a micro milk churn. It’s not just chefs who are using dehydrators to create flavours with herbs, vegetables, meat and fish… bar keepers are using them to create interesting and long-lasting garnishes. Several companies showed drinks infusers – water jugs and dispensers designed to hold fruit and/or ice for a tasty hydrator. There’s been a huge swing towards portion control – with portioners providing a ready solution. Suppliers report a surge in interests in a range of sectors, from schools to sandwich bars. As well as saving costs, a portioner can deliver consistency and accurate nutritional values. Several table top hobs were on display, and several companies are offering wok induction hobs. Induction-compatible pans are now pretty much the norm. Reinventing itself with new glasses to show off the botanicals. Platters, small plates… sharing is sociable and popular but it’s not just about food, we’re going to be sharing drinks too, soon apparently, with multi-portion cocktails on the way over from the States. With afternoon tea still growing, Contacto launched a new range of cake stands. Available in chrome or black, their straight sides mean each of the three tiers accepts the same size plate. Meanwhile the new mini milk churn, made of stainless steel and designed to serve – you guessed it – milk, drew approving ‘awwws’ from visitors. Trends: vegan, allergen, and copper is still in the mix. 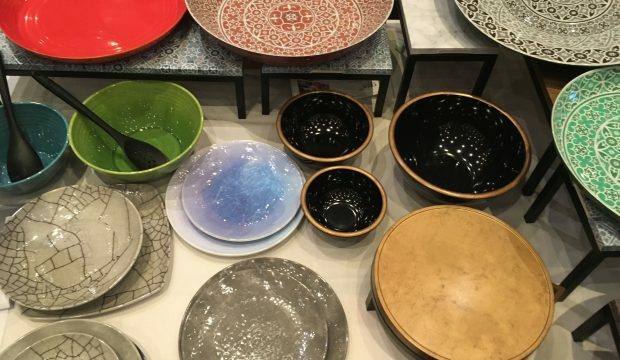 First time exhibitor Creative Retail Display showed off its new melamine tableware and launched the striking Marrakesh range of oversize melamine bowls featuring Moroccan-themed geometric patterns. Trend: melamine plates and bowls for starters and sharing platters. The company’s latest Made in England stoneware design is Studio Grey – a collection of bowls, plates and platters combining artisan and urban chic. The products’ reactive glaze is not only striking looking but also hard wearing. Denby brought along potter Sean Flint, whose skill on the wheel entertained and enlightened delegates. Trend: mix and match – different colours, different textures, creating that elusive point of difference. A new CESA member, Dometic showed its range of food transport boxes. The CFX series has a temperature range of from -22°C to +10°C and can be powered from a car or van’s 12 volt supply. The largest CFX can hold 100 litres and models are also available in dual temperature versions. Trend: Luxury artisan ice cream makers catering at events and festivals (they’re using Dometic’s boxes for transport and storage). A company that is synonymous with toasters, Dualit launched its latest conveyor model, the DCT2i. Six years in development, it can produce 560 slices of toast per hour, compared to 300 for the existing model it is replacing. The DCT2i features a standby mode to reduce power consumption by up to 70%. Trend: for lower volume use, within offices, boutique hotels, etc., semi commercial coffee capsule machines such as Dualit’s CaféPro provide a perfect solution. New lines in the Rosetto range of buffet display products include bronze risers and bakery display cases. Meanwhile the Lodge dishwasher safe Triangular mini cast iron dishes allow servers to fit them together for multiple display configurations. Trend: sustainability – the “Pokito” re-useable Cup pops out to fit 8, 12 or 16oz drinks and comes in 6 colours. Once it’s been used, collapse it down, pop it in your bag then wash it when you get home. The elegant tableware supplier showcased a stylish round teapot with infuser and the mirror finish, 12-sided double cafetière. Both ranges are manufactured to the highest standard in 18/10 stainless steel. The 12 -sided cafetière is a chic and unusual way to present and serve coffee or tea. The teapot infuser uses a fine mesh, in durable stainless steel, to allow for brewing of even the finest teas. The hinged lid and hollow handle are practical and durable. Trend: the market is moving away from teabags and single tea options, instead offering a tea menu and selection of different flavours and infusions. Both new models help meet the demand. New additions to the Cubic display range include bamboo buffet units, while Spanish manufacturer Pujadas also has buffet heat lamps and competitively priced stainless steel gastronorm containers, available with clip on, colour coded lids. From Cambro comes the Century Wood Grain tray, made of dishwash safe polyester but with the look and texture of wood. FEM also showed the new countertop food processor from Hamilton Beach Commercial. Trend: food management systems – FEM was another company showing a range of allergen control products. Equilibrium knives feature ice hardened blades and offer lasting sharpness and rust resistance, while their curved handles provide a comfortable grip. New premium Café Olé teapots are available in six sizes and have non-drip spouts and hollow, ‘stay-cool’ handles. Trend: hydration – as exemplified by the company’s new infuser jugs with removable neck strainers. Hendi UK only launched in January 2018, though the Dutch manufacturer was founded in 1934. The company has a 9,500 sq ft warehouse in Lancaster and showed a selection of its products, including new dehydrators. Table top ice machines also created a lot of interest. Trends: using dehydrators to create healthy snacks, and more and more chefs are going for induction hobs. The latest Caedo blender, due to launch till later in 2019, includes Bluetooth connectivity so recipes can easily be programmed in, for example from a smartphone. Metcalfe continued to promote the heavy duty Hallde range of food prep machines, which focus on safety and ergonomics. Trend: Raw food and vegan. Well-designed food prep equipment helps keep the colour of food vibrant after processing. The company first showed a prototype of its innovative Crustastun, a humane method of killing crustaceans, at the 2018 forum. Now Mitchell and Cooper has developed a special holder that can despatch several langoustine and crayfish at the same time. The duration of the Crustastun’s stun is programmed at 10 seconds for crabs and 5 seconds for lobsters, this kills as well as stuns the animal, ensuring no recovery before death. Trend: Legislators around the world are looking at how crustaceans are prepared – humane solutions may well be a legal requirement soon. Having opened a new showroom in the Business Design Centre, Islington, Nevilles showed how customers outside of London can take an interactive virtual tour from the comfort of their PC, tablet or smartphone. They also showed their new buffet display products and melamine bowls. Trends: healthy living and vegan are both big, and gin is still growing. Pro Foodservice Reps launched a new brand at the Forum. Based in Miami, Front of the House (FOH) supplies a huge range of products, from buffet display units and trays to Metro Weave, which can be made into table mats, coasters, tray toppers and so on. The brand’s stylish Drinkwise glassware is BPA free, stronger than polycarbonate and SAN alternatives, and offers glass-like clarity. Its Servewise poplar wood cones and cups are ideal for street food operators. Trends: sharing cocktails – they’re on their way from the USA – and eco, in the form of porcelain made using recycled porcelain. A new range of steak knives feature Sheffield steel blades with handles made of Roweca. This eco material looks and feels like wood (it’s made of recycled paper) but is dishwash safe and copes with heat up to 175°C. Row & Sons also showed its high end, self-healing Apex cutting boards. Trend: bespoke products such as branded chopping boards are in big demand – especially ones that can be made in low numbers. From French manufacturer Chasseur comes a range of cast iron cookware with the option to brand or decorate to create an unusual point of difference. Pinti Inox has the stylish Sushi Pro range of cutlery, with ABS plastic applied to the handle to add a splash of colour to the table. The Caleido range of buffet displays offers mix and match colours and various configurations. Trends: muted colours with matt finishes and small, specialist cutlery pieces. Another new exhibitor, STV is one of the UK’s largest specialist manufacturers of pest control products. Established in retail, it believes its range is ideal for small to medium catering operations. Innovative products include the attractive Honeypot Wasp Trap, which is suitable for customer outdoor areas. The company offers products to tackle rodents and insects, inside and out. Trend: The trapping of a 12lb rat in London recently underlines the growing need for pest control as part of the focus on health and safety. Inspired by the love of the sea, ‘Ocean’ is a fish-themed range of front of house products, such as boards, platters and bowls, using materials including wood and ceramics. Ideal for fish restaurants, fish and chip shops and coastal stores. With the media focus on plastic pollution in our seas, T&G hopes this range will engage everyone in a conversation to rethink plastic use and consider what can be done to help. The company makes a donation to the charity Plastic Oceans UK from the sale of items in the Ocean range. T&G’s new salt and pepper mills include the organic shaped wood Halo and Sphere ranges. Trend: the focus on bespoke products – T&G has invested in a laser engraving machine that adds graphics, logos, branding and text to many of the company’s products. As a first-time exhibitor, American manufacturer TableCraft’s products were new to the show. Highlights included a gastronorm compatible two-tier display unit which can be used with crates in black or Acacia wood or with Melamine trays and toppers, thus offering a choice of rustic or contemporary looks. This can be used with a cooling plate which keeps product chilled for up to four hours or as a stand-alone piece of kit. A selection of new melamine products included the new Barnwood Collection of rustic-looking serving platters in various sizes, suitable for individual table or buffet service. Trend: allergen awareness – TableCraft’s ideas include purple silicone bands and tethered caps which can be added to a standard squeeze bottle in order to seal and colour code it.